Shock, horror is at it again regarding care. The review of home care by the Equality Commission has found that care supplied by agencies to people’s homes may be breaching their human rights. Half of the 500,000 people receiving such care reported they are satisfied with the care provided, half are not and there is no shortage of shock, horror stories. We have been down this road before in the treatment of vulnerable people in care homes, now we see the problem is endemic in private houses. It is too easy to suggest that it is because the providers are mainly private companies and are stretching their resources to squeeze as much money out of the time provided for each home visit. After all, local authority provision has been found out in these areas many times. But it does leave a bad taste when you realise that profits are not only coming before people, they are also dependant on the misery of people. I know about this first hand. Two years ago a private company bought the adjoining terrace house to us and made it into a small care home for five women with mental health problems. Having worked in this area myself when I was a social worker I know the problems associated with placing people in the community who cannot cope with the everyday pressures this change of lifestyle brings. The result, one resident had to be moved back to secure accommodation after a litany of abuse, screaming and inappropriate behaviour culminating in her hurling a heavy object into our garden and so threatening the safety of our children. And now we are being forced to complain about another resident who presents similar behaviour. Having bought such services when I was a commissioning manager, I know the kind of riches that can be made from working with vulnerable people coming form a secure or semi-secure environment. It does not take much of a mathematical brain to see why the company in question is prevaricating on our complaints. I do not have a problem with companies which provide a good service being able to manage care services but too often ‘good service’ takes a back seat to ‘healthy profits’ with the subsequent shock, horror reports of neglect. The answer to these problems is actually quite simple; registration, inspections and follow-ups should be much more rigorous than they are. CQC on taking my complaint, made an unannounced inspection, found the resident was out and left it at that. It is this kind of intransigence that leads to shock, horror headlines. There is a joke among chess players that goes like this; two players are embroiled in a game and one says, ‘let’s make it interesting’ to which his opponent replies; “OK, let’s stop playing.’ I own up to being a lower than average club player who enjoys playing in leagues and tournaments with no illusions of grandeur. My ambition is to write a chess book, “My sixty cr*p games” a reference of course to the masterpiece by the late and more than great Bobby Fischer whose 60 memorable games is one of the greatest ever books on chess. From my archive I will have plenty of losing games to choose from! 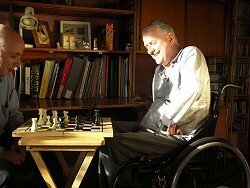 So what has chess got to do with the image of care? Well, the charity Chess in Schools and Community, CSC, has had success in helping young people from disadvantaged areas and communities improve their lives. The charity is pushing the game in primary schools across the UK and youngsters who have been involved in negative types of battles in gangs are now enjoying the endless possibilities offered on the 64 squares. Chess is second only in participation to football, an estimated 500 million people in 167 countries play the game and in some countries it is on the national teaching curriculum. Chess’s unique selling points are that it is universal, with no barriers of age, gender, race, physical disability or language; it has a positive image and that it has educational and social benefits backed by academic research. And those of you reading this who have enjoyed the occasional game on the beach will testify that it is a cheap, fun pastime that can be relatively easily picked up and enjoyed. Chess may not seem ‘cool’ but the world’s number one player, Magnus Carlsen from Norway, starred in a fashion shoot for G-Star and plays matches with Formula-1 style sponsorship on his shirt. So I applaud this initiative by CSC and wish the charity well.